Poultice Leaving a Bigger Stain? Your stone needs to be sealed ? Here’s a consumer question regarding their concern about a poultice leaving behind a bigger stain on marble. The inquirer inaccurately named the problem a “stain,” but he understood correctly that what he was seeing was darkness from moisture that had wicked out beyond the original stained area, suggested by his question about using a blow dryer. This problem is normal and easy to resolve. Natural stone that is not sealed will not only allow a staining agent to penetrate, but it will absorb and stay wet for a while from the poultice application. This will cause the stone to appear darker. The effect can be likened to a pair of denim blue jeans. Any area on jeans that gets wet with water will appear darker than dry denim. It’s not a stain, and it will return to normal once it dries. Likewise, the darker stone technically is not stained, and will eventually dry out on its own, but there are ways to speed up the drying time. We instructed our inquirer to spread cooking flour over the discoloration and allow it to dwell overnight. 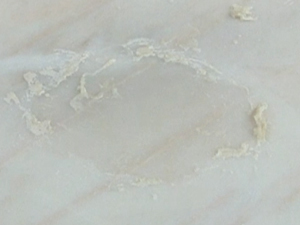 The flour would absorb the moisture, restoring the proper appearance to the stone underneath. Does your stone need to be sealed? There is a bigger issue here that needs to be addressed. If your natural stone needs to be sealed, it will absorb staining agents and moisture. In fact, a simple way to know if your stone is adequately sealed is to put a few drops of water on any areas that are used most often. Wait for a few minutes, then wipe the areas dry. If the surface of the stone does not darken, that means the stone is adequately sealed. If your stone does need to be sealed, contact us to have it professionally cleaned and sealed.